Look what I have got: Soumitra Chatterjee shows his KIFF award to the audience. Photo courtesy: Mamata Banerjee's FB. Kolkata: First time since Trinamool came to power in Bengal, ace actor Soumitra Chatterjee today turned up at the inauguration of the Kolkata International Film Festival (KIFF). Perceived to be Left-leaning, Chatterjee, along with Mrinal Sen, used to be the prime face in the annual film fest until 2011, the year Trinamool threw out the Left from power after 34 years. After this, he had skipped the film fest all this year. Chatterjee’s presence today at the inauguration of the 24th edition of KIFF at Netaji Indoor Stadium, however, is not a surprise. 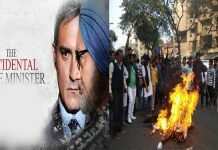 Last year, he had received Banga Bibhushan award from Chief Minister Mamata Banerjee, indicating at the breaking of ice with the Trinamool regime, whom the CPI-M often accused of trampling democracy by killing opposition party cadres and destroying of party offices. 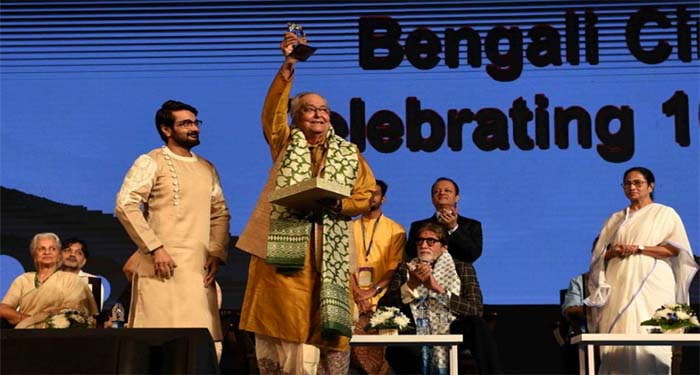 At the KIFF inauguration this afternoon, Chatterjee was also conferred with a special award on the occasion of the 100th year of Bengali Cinema. The star-studded inauguration of KIFF 2018 at Netaji Indoor Stadium. Photo courtesy: Mamata Banerjee’s FB. Like the previous three years, this time too, the fest has been declared open by Amitabh Bachchan. 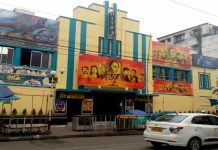 He also unveiled a directory of Bengali Cinema prepared and published by the state information and cultural affairs department. 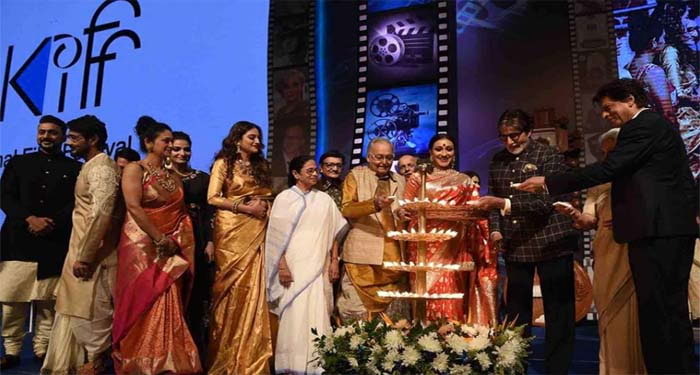 Commenting at the star-studded event, the Chief Minister said that with a little more support and nurturing, Bengali film industry can even beat Bollywood. She announced that the state government will celebrate the silver jubilee of KIFF next year in a befitting manner. Actors Shahrukh Khan, Jaya Bachchan, Waheeda Rehman, Nandita Das, Sanjay Dutt, Hollywood director Mahesh Bhatt, Iranian director Majid Majidi, and of Australian director Phillip Noyce were among a large number of Tollywood, Bollywood and foreign movie personalities who graced the inaugural event. “I salute Kolkata, the city of Satyajit Ray,” Majidi said in his brief speech. The film festival will be underway till 17 November. 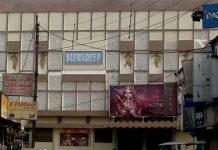 In all, 107 acclaimed movies from all over the world will be screened at several venues including, Nandan, Sisir Mancha, Rabindra Sadan, New Empire (New Market), PVR Avani Mall (Howrah), Mitra (Hati Bagan), Basusree (Rash Behari), Navina (Tollygunge), Inox City Centre-I (Salt Lake), and Nazrul Tirtha (New Town).